… and now in a major exhibit at the National Military History Center in Auburn, Indiana. The exhibit covers about1,000 square feet and features about 500 vintage photographs and numerous display cases. Its existence is a significant accomplishment for the CAP Historical Foundation and for CAP itself. 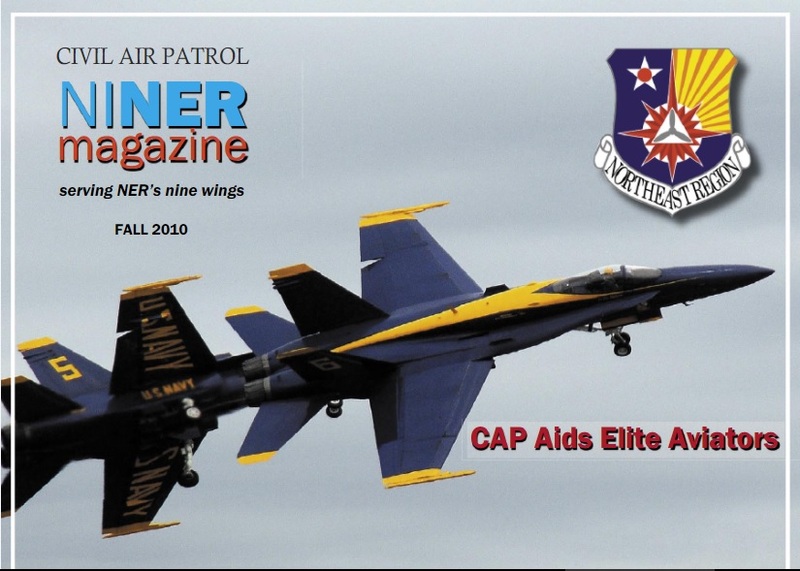 Spencer Morfit and Maj. Jim Shaw, CAP’s national curator and executive director of the Civil Air Patrol Historical Foundation, worked with the military center’s curator, Josh Conrad, on the display, for which Morfit wrote the text. “Josh Conrad was absolutely insatiable,” Morfit said. 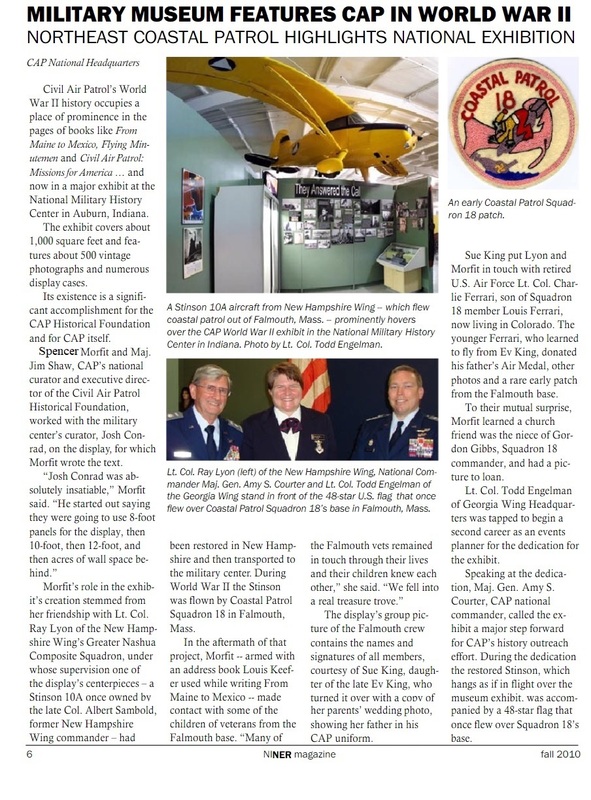 “He started out saying they were going to use 8-foot panels for the display, then 10-foot, then 12-foot, andt hen acres of wall space behind.” Morfit’s role in the exhibit’s creation stemmed from her friendship with Lt. Col. Ray Lyon of the New Hampshire Wing’s Greater Nashua Composite Squadron, under whose supervision one of the display’s centerpieces – a Stinson 10A once owned by the late Col. Albert Sambold, former New Hampshire Wing commander – had Been restored in New Hampshire and then transported to the military center. During World War II the Stinson was flown by Coastal Patrol Squadron 18 in Falmouth, Mass. In the aftermath of that project, Morfit — armed with an address book Louis KeeFer used while writing From Maine to Mexico — made contact with some of the children of veterans from the Falmouth base. “Many of the Falmouth vets remained in touch through their livesand their children knew eachother,” she said. “We fell into a real treasure trove.” The display’s group picture of the Falmouth crew contains the names and signatures of all members, courtesy of Sue King, daughter of the late Ev King, who turned it over with a copy of her parents’ wedding photo, showing her father in his CAP uniform. Sue King put Lyon and Morfit in touch with retired U.S. Air Force Lt. Col. Charlie Ferrari, son of Squadron 18 member Louis Ferrari, now living in Colorado. Theyounger Ferrari, who learned to fly from Ev King, donated his father’s Air Medal, other photos and a rare early patch from the Falmouth base. To their mutual surprise, Morfit learned a church friend was the niece of Gordon Gibbs, Squadron 18 commander, and had a picture to loan. Lt. Col. Todd Engelman of Georgia Wing Headquarters was tapped to begin a second career as an eventsplanner for the dedication for the exhibit. Speaking at the dedication, Maj. Gen. Amy S.Courter, CAP national commander, called the exhibit a major step forward for CAP’s history outreach effort. During the dedication the restored Stinson, which hangs as if in flight over the museum exhibit, was accompanied by a 48-star flag that once flew over Squadron 18’s base. Be the first to comment on "CAP Connections and Profiteers"